That was the scene between me and the gentleman pictured above and his friend. One flew in Denver and the other from Omaha (no, I’m not making that up) and they were quite despondent after the beatdown that their Broncos were on the wrong end of a few hours beforehand. They didn’t even make it to Penn until nearly Midnight and I had to feel sorry that they were subjected to the cattle car that their experience on New Jersey Transit had turned into. That, and many more like it, were all a part of the 48th rendition of the game formerly known as the AFL-NFL World Championship, which was played in my home state last Sunday. For all the hype, pomp, pageantry, buildup, and excitement over it, the contest turned out to be colossal letdown – unless you were one of the people I saw walking around with a green and blue mohawk. Even though it paled in comparison to the some of the more exciting finishes to the NFL season that have taken place in recent years, the week leading up to it was also a dud in some regards. 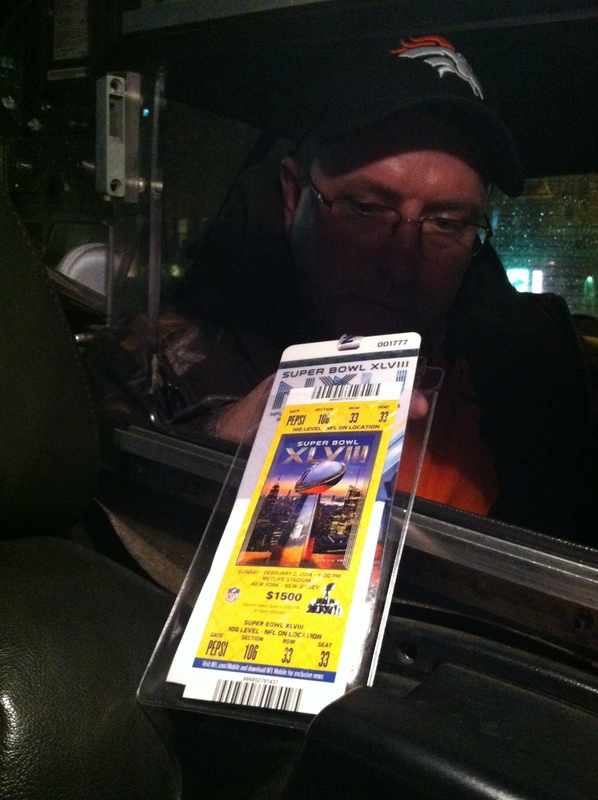 Ticket prices had to be slashed because the face values were set too high, hotels and motels on this side of the Hudson didn’t full up as many had predicted, and of course, the governor of my home state was given a nice big Bronx cheer when introduced on Super Bowl Boulevard during the week leading up to the game. Then there was the multiplier effect…or lack thereof. Traditionally, the two worst times of the year to be driving a yellow vehicle around the streets of New York are the dog days of summer and the dead of winter and as anyone up here can still attest too, this year’s ranks with the worst that New York has seen in quite some time. Once the confetti and streamers were cleaned up from the ball drop, it’s usually 2 to 2 1/2 months of sleepy weeknights and relaxed weekends, until the equinox and shamrocks come into view. This year would be different though, since throngs of fans from the Rockies, the Pacific Northwest, and lots of places in between would descend upon the Big Apple, eager to participate in the first Super Bowl played in a outdoor, cold-weather site. Like so many other promises that come with big-time sporting events, this one also didn’t live up to the hype. It should have come as no surprise that earlier in the day, both Punxatawney Phil and Staten Island Chuck saw their respective shadows, ensuring that according to lore, that there would be six more weeks of winter. While the weather turned out to be relatively mild that day, their harbingers were correct in the sense that the windfall that many in my profession hoped to see never fully materialized. Monday and Tuesday of that week were some of the worst weeknights that I had experienced in months and it wasn’t until the night before the game that I felt like I was running around at full steam. That’s how most of my Summer nights play out, regardless of the day of the week. It shouldn’t have come as a surprise that the seeds that failed to grow into a financial bloom were sown months before the game, however. 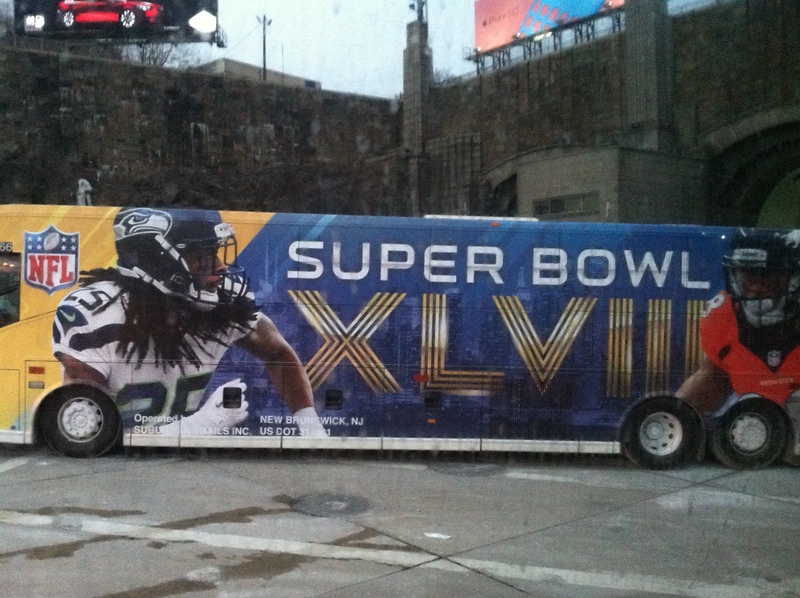 The TLC and the city DOT had made it pretty clear that this was to be a “mass transit” Super Bowl. Traffic would be bad! Get there early! Don’t even *think* of driving to the game! These phrases and anything of the like were drilled ad nauseum for weeks. Forget dropping off anyone, anywhere near the Stadium, as passenger vehicles weren’t even allowed into the lot for parking and tailgating. Of course, plenty of shuttles were available for those who would fork out 3 or 4 times the normal going rate for a Giants or Jets game. Traffic? 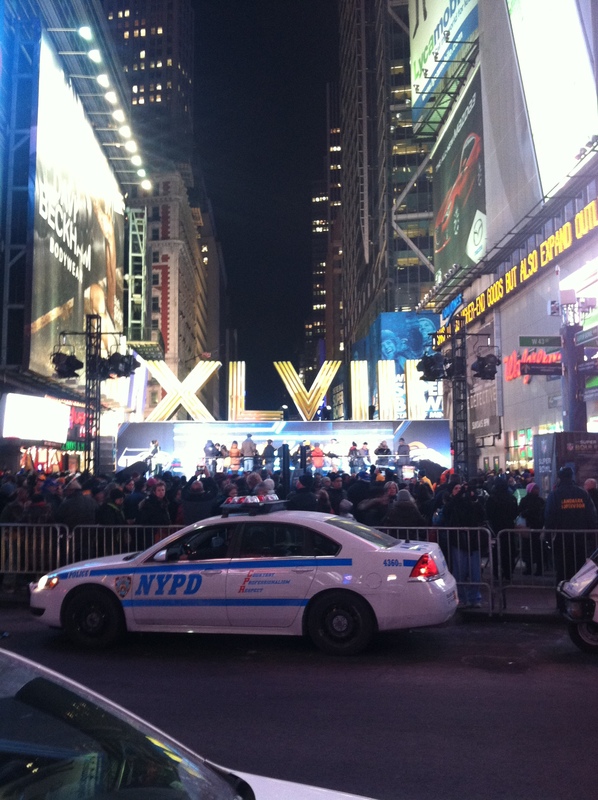 There was tons of that too as Super Bowl Boulevard closed off Broadway from 47 St down to Macy’s. Most Taxis have no use for what’s left of the Great White Way but the extra pedestrians that crowded it for the rides and attractions made getting around Midtown hellish at times. This was especially the case when the theaters were open and compounding the problem was the brilliant idea of scheduling “Broadway Week” in the midst of the 5-ring circus. Not only did I have to hear the ad for that in the back of my Taxi, but I had to laugh at the city’s attempt to counter the throngs of sports fans roaming around and to lift up sales during a weak time of the year, by having this promotion at the same time that the Super Bowl festivities were in full swing. I still had to work as much as I could that week, since Mother Nature has done her best to keep me home as much as possible this winter. Even if I didn’t have an uptick in business, it was a chance to soak in all that was done to build up attention for the game. 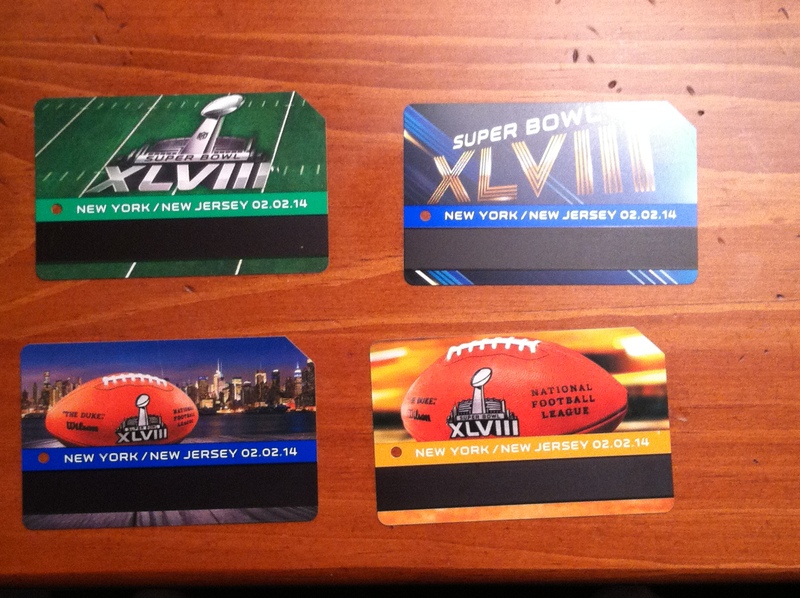 The four metrocards shown below were randomly distributed to Subway stations around Manhattan, and while most New Yorkers didn’t think twice about them, I managed to snag all four after some intrepid scouring. 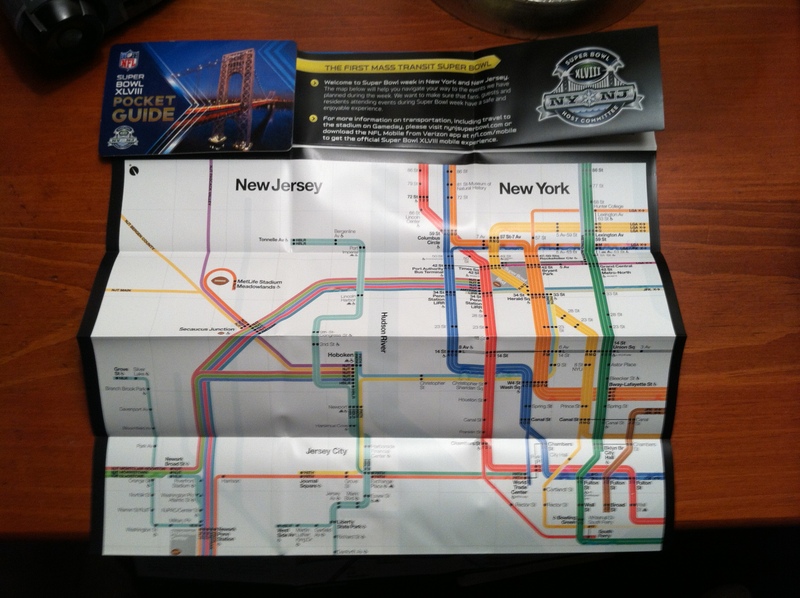 There was also a handy map that was handed out for free outside many of the stations and on the Boulevard itself and while I have enough subway and rail maps here to satisfy any transit buff, it was nice to finally see one that showed all of the regional rail links on one page, with helvetica to boot. Billboards, ads on other Taxis, bags, shirts, a countdown clock in Times Square and yes, even the stadium that I have to pass twice a day during my commute, were all done up with large roman numerals to drive the point home. Naturally, I ended up working the night of the Super Bowl. A few of my passengers noted that I missed the game but I countered that I also missed the chance to tack on two or three pounds in a day. More importantly, I knew that the West Side would be hopping throughout much of the night and since the “mass transit” Super Bowl turned into a mass headache for so many like the Broncos fans I mentioned above, it ended up working out in my favor. I normally keep the radio off during work and given that the game was seemingly in Seattle’s hands from the first play onward, it was nice to ride around in peace for much of the night. 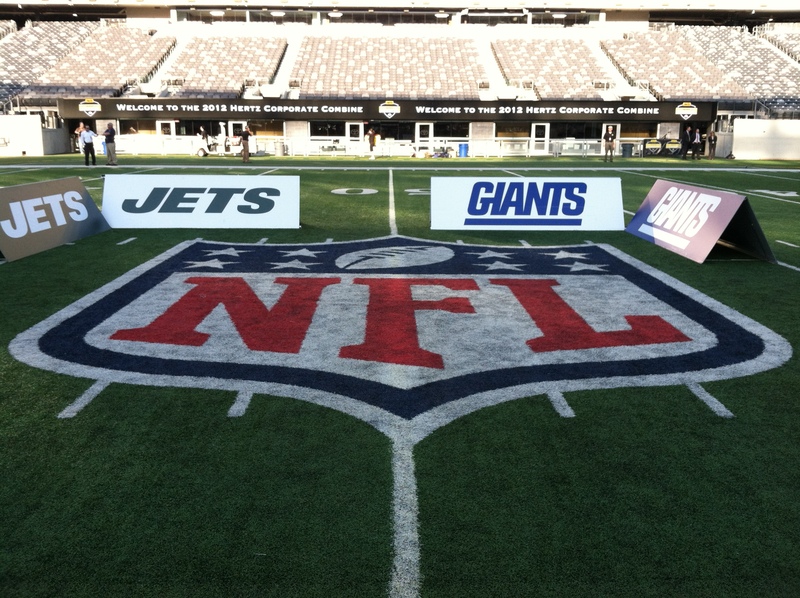 No one has any idea if the final contest of the NFL season will ever return to New York. The owners will meet in the off-season to discuss league issues, rule changes, and potential Super Bowl sites starting with the first open date four years from now. Chicago, New England, and Washington have all expressed interest in hosting the game and since the weather cooperated this year, that remains a possibility should the league decide to give it another go. 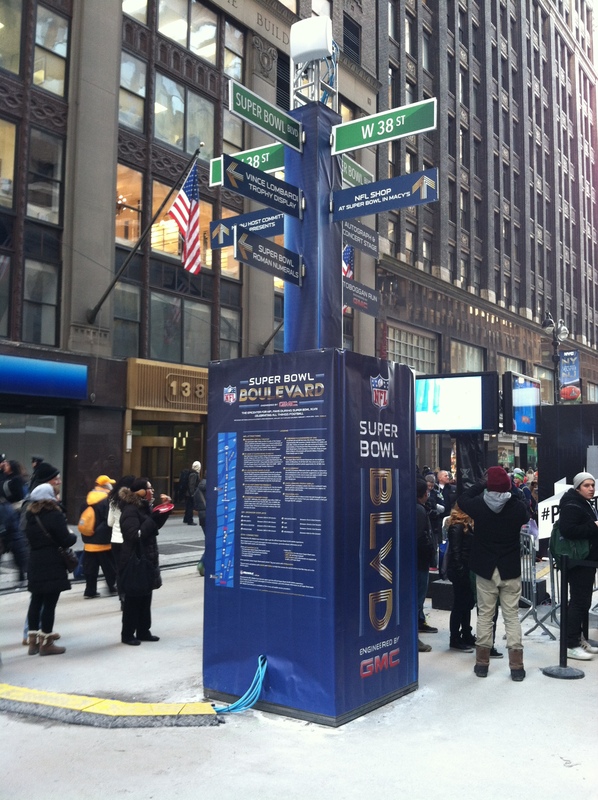 In a place like New York, even the Super Bowl isn’t enough to stop the city in its tracks. Fashion Week, Restaurant Week, New Year’s, the Dog Show, UN Week, and other annual events may bring parts of town to a standstill but in the Outer Boroughs or even on the Upper East Side, one would hardly know that anything was going on unless someone brought up current events. It’s a testament to how large and diverse New York is that one can get away from the madness without having to get far out of town and during Super Bowl Week, at least a third of my passengers didn’t express any interest in the game or had the slightest clue which two teams were vying for the privilege to hoist the Lombardi Trophy. It would be great if there was a countdown clock in Times Square that gave the hours and minutes until hunger was eradicated in the Big Apple, or until enough apartment units were constructed to house the homeless and those living in overcrowded, subdivided spaces. Landing the Super Bowl three years ago or the failed attempt at the Olympics was the lead story on the local news on that particular night but most New Yorkers have no idea where the Cornell Tech Campus is set to rise in the coming years (It’s Roosevelt Island for anyone interested). Throngs of people waited in line for hours to see the Lombardi Trophy, the Rockettes, or former players but how many New Yorkers have been to a vest pocket park within the last year, or to one of the scores of new museums that are popping up all over town? For all the amazing, wonderful, and diverse people that I see in a given week, too many of them would rather focus on the trivialities of life instead of the arts and sciences that are incubated in the Big Apple. While I love what sports is capable of and the way that it is still the ultimate and purest form of meritocracy in the 21 Century, there’s so much more that needs to be touted in New York. Now that the game is over and things are mostly back to normal for the rest of the winter, nothing would make me smile more than to hear that innovation, sustainability, and affordability will be what New Yorkers demand and ultimately, take pride in as the icy doldrums slowly recede and the new Mayor starts to leave his mark for future generations. Who knows? Maybe the city will become so desirable that the announcement of the next Super Bowl awarded to the Meadowlands will take a back seat to something much more likely to improve the quality of life for the residents of Gotham. 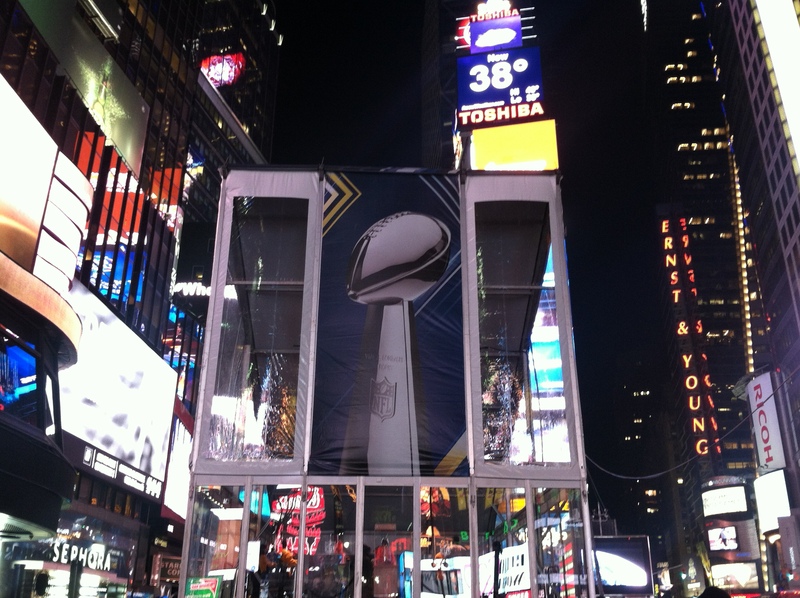 This entry was posted in Events and tagged Super Bowl, Times Square.